I attended the FoodBlogSouth Conference this weekend. After hearing talks by some of the country’s best food writing experts as well as highly successful food bloggers, I came home energized and inspired and recommitted to upping my game and putting myself out into the world in a bigger way. I also came home with some anxiety about what that all means. Molly Wizenberg, creator of Orangette, gave the keynote address at the conference. She spoke at length about her 10-year journey in writing a blog and how it has changed over time. Predominantly a food blog, Orangette has endured periods where Molly writes more about her life than about food. She talked about feedback from disappointed readers but was committed to writing what felt right for her. I heard from speaker after speaker that we must find our voice and be authentic. We must be real and let our readers know who we are. Exposing yourself and your life in a blog can be a daunting task sometimes. Writing about the food I make comes easily for me. Writing about me…not so much. I think some of my insecurity lies in thinking that my life is not particularly interesting enough to write about. I guess we all feel that way to some extent. Being real and authentic did strike a chord in me, though, and instead of writing what I think visitors will want to read, I want to write what is true for me. It might be hard sometimes, but it’s what I’ll strive for. Don’t worry…I’ll still be writing about food. That’s my passion and will continue to be. I’ll try not to stir up controversy with my posts, but I do want to stay real and true to myself. On a lighter note, the Super Bowl is coming up. It’s been a cold winter so far and nothing warms the soul more than a bowl of chili. This version is perfect for your Super Bowl party. I’ve made a couple of chili recipes for previous posts, but this green version contains tomatillos and poblano peppers. 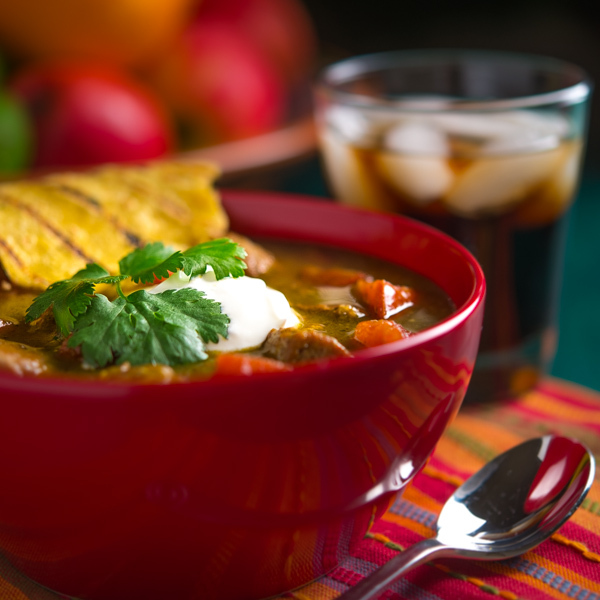 This chili features pork shoulder as the main attraction. Make it ahead of time and refrigerate until your guests arrive so your last minute work is minimized. 1. Preheat 2 tablespoons olive oil in a large Dutch oven or soup pot over medium high heat. Brown pork in batches. Set aside. 2. Preheat oven on broil mode. Place garlic, poblano and jalapeno peppers, and tomatillos on baking sheet and drizzle with olive oil. Place sheet in oven and broil for 4 to 5 minutes or until peppers and tomatillos are browning. Watch carefully to ensure vegetables don't burn. Remove from oven. 3. Place vegetables in the bowl of a food processor or a blender and process until slightly chunky. Set aside. 4. Transfer onions to Dutch oven and saute 5 to 7 minutes, adding oil as needed. Add chicken stock, pureed vegetables, tomatoes, pork, cumin, salt, and pepper. 5. Bring to boil, reduce heat, cover, and simmer for 30 to 45 minutes or until pork is tender. Adjust salt and pepper to taste. 6. Heat a grill pan over high heat. Grill tortillas for 45 seconds to 1 minute on each side, just long enough to heat and leave grill marks. 7. Ladle chili into bowls and garnish with a dollop of sour cream and cilantro. Serve with grilled corn tortillas. I made this on Valentines Day for my Fiance . He saw this recipe and thought it looked good.I am not the best cook but it was really easy and it tasted super good.I cant wait to make it again and try out some of your other recipes. Thank you so much for letting me know how the recipe worked for you. I always like getting feedback. I appreciate you dropping by and I hope you’ll be back soon! I enjoy dropping by your website to see what’s cooking. I love to cook and have thought about food blogging myself, but still can’t quite take that step. I follow several food blogs. Your food styling and photographs are the best I’ve seen. Even better than pioneer woman. Very professional quality. Your food is not just the same old recipes that we see over and over again. They are creative and unique. (I still love those old tried and true recipes too!) Part of the reason I follow your blog is because you are from the south and are a gay man ( I assume?!). I am gay and from Oklahoma. All the other blogs I follow are women. As a gay man it’s oftentimes hard to find positive role models. Because people are afraid to put themselves out there for fear of judgment. From the things I’ve read on your blog, you sound like you have a great life with your partner. I like the stores of you growing up in Mississippi and of your grandparents. Cooking for me is about more than the food. It’s about all the memories and good times shared with the people that we love that may no longer be with us. Food just triggers those sweet memories. I look forward to hearing more about your life, along with the great recipes. This chili sounds amazing, can’t wait to try it! Bill, sometimes what we think is uninteresting or not noteworthy, strikes a cord with someone – and you just might find that that’s what they needed to read. I love your blog, your photos, anecdotes and stories – wherever you decide to take it, I will be reading along! And on that note – going to “FoodBlogSouth Conference ” is blogworthy indeed! I keep wanting to attend a conference,but the timing hasn’t worked out for me – so I “attend” these conferences through blog updates. Was i a day long event? Are you going to the Bloggy Boot Camp conference in Atlanta on Oct. 11th? This chili verde sounds perfect for this crazy cold weather evenings here in GA! I’ve actually been avoiding food blogger conferences because I’m afraid it will overwhelm me or make me feel inadequate. But I’m on board with being authentic and using your “real” voice — it’s fun to see how much more of a connection you can make with your readers that way. Your recipes (like this chili!) are great, so keep ’em coming, Bill! Thanks so much, Julianne. I would highly recommend going to a conference. As much as it introduced a little anxiety, it was a great experience and was incredibly inspiring. I loved meeting other food bloggers and hearing about their experiences. Bill, this is a chili I would gladly have several delightful bowls of. Hey Bill! Your post really resonates with me after the conference. Trying to take in lots of ideas and advice at the same time as sticking to your own voice can be really tough. I’ve also had a hard time being my real self on the blog instead of just writing what I think peoe want to read. And in terms of your success? I always tell myself that if I’m doing what I love and always getting better, then I’m on the right track. This chili looks great, too, and I love the photo? Is that with a strobe? I love the highlight on the top of the soup. Thanks for much for dropping by, Randle. It was so great meeting and talking with you in Birmingham. It was really good for me to meet other bloggers and hear about their experiences. Let’s keep in touch! I love this post and I also love Deby’s comment. I agree with her that I can hear your southern drawl in your writing. 🙂 Bill, you do a great job! I love your writing and your photography is gorgeous! Now for the chili verde – YUM! I love the sweet flavor of chile peppers combined with tomatillas. A perfect recipe for this coming Sunday! I so appreciate your support as I’ve gotten my feet wet in the blogging world, MJ! Thank you so much for the kind comment! It really means a lot! Your blog was one of the first ones I started reading and I’ve always loved your posts. Keep up the good work! I sometimes go home, feeling inadequate and wondering if my blog will ever reach epic proportions with an audience. I finally accepted that I can’t quit my day job by living off my modest earnings. Know what? I stopped worrying about how many comments I’d get. My traffic reports indicate that I get a lot of people reading, but not commenting. I sometimes think my photography isn’t quite up to snuff– and when I see your pictures, I wish I was as good a photographer as you are. Your food styling is always beautifully done. I think you have found your own voice. I can almost hear a very soft Southern drawl (am I wrong?) You make beautiful food, that I want to eat. So, just be you. People who know me, say that I write just the way that I speak. I’ll take that for a compliment. Blog, because you enjoy it. I’m guilty of reading your posts and not always leaving a comment (maybe I’ m peeking from work). As for this recipe… I make chili for every Super Bowl and I’ve made different variations of chile verde. This recipe screams for me to make it– seriously! Yum! HI Debby, Wow! I can’t tell you how nice it was to read your comment. As a still fairly new blogger, I feel like I’m still finding my way and hearing your feedback makes me think I might be on the right track. From the very beginning, I have felt tremendous support from you and I so appreciate it. To answer your question, I’ve been accused of reverting to a bit of a southern accent, particularly when I’m talking with family. I’m a big fan of your blog too and I’m always so busy I don’t always have time to leave comments on my favorite blogs. Thanks again for such a supportive comment!